We’d love your help. Let us know what’s wrong with this preview of Their Souls Met in Wishton by Wanda Penalver Bevan. 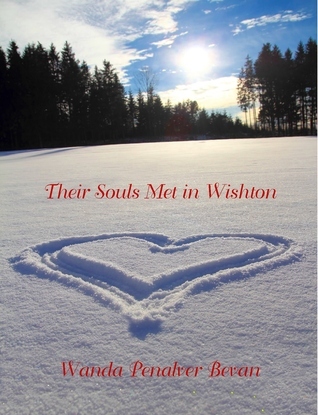 To ask other readers questions about Their Souls Met in Wishton, please sign up. This book was a mish mash of back and forth, but a nice story came from it. I enjoyed the references to the song titles and being able to read the chapter relating to that song with the particular song in mind. I received this book free from Goodreads First Reads. As nice a book as this is I think that this story needs more sub plot. Its a nice generic story and although it's a nice story to read I think it needs more developing in the story department. Their Souls Met in Wishton was a really good read. It jumps back and forth between reality and the "what ifs" in life, which I found to be confusing at first, but in the end it makes a beautiful story filled with love and heartbreak. I thought this book was really well written and I will definitely read more from this author. Miranda has a past love, Liam, that comes back into her life, and after thinking about what happened and what could have happened, she decides to write a book that encompas Their Souls Met in Wishton was a really good read. It jumps back and forth between reality and the "what ifs" in life, which I found to be confusing at first, but in the end it makes a beautiful story filled with love and heartbreak. I thought this book was really well written and I will definitely read more from this author. A well-written story by new author Wanda Penalver Bevan. She weaves a beautiful story around the ‘what if’s’ in life. Interesting characters, Miranda the main character is writing a book based on her life and a past love, Liam. We all have a Liam in our past and wonder what would’ve happened if we’d taken the path not traveled. A story within a story. Looking forward to reading more of this author's work. I voluntarily reviewed this book. This is the first book I've read by Wanda Penalver Bevan and I have to say WOW. I loved the story and the story within the story. Having references to song titles made the book more fun to read. I look forward to reading more of this author's books and highly recommend this one. Great vacation or travel read. Not my usual genre of books...but a good read. I highly recommend it.